For me the basic principle of dining out is to get something that I don't make at home. (Sometimes that includes because I'm lazy.) I'm not interested in going out for grilled salmon and steamed veggies. I can do that at home! 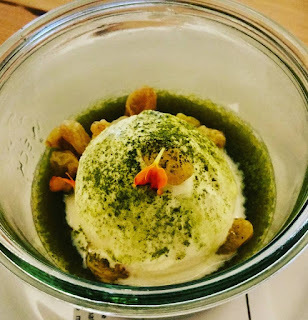 I also prefer to try new dishes that I haven't had before or are done in a unique way. That's how I first had bone marrow, foie gras, and sweetbreads. This is one of the reasons I'm loving Skool. As Sacramento's dining scene increases with the new arena and ever blossoming social scene, it's important that new restaurants joining the fray bring something fresh to the party. Skool does this. In a few words, Skool offers Asian influenced seafood without offering sushi/sashimi. Skool is obviously a play on "a school of fish". Oh, and happy hour is called "detention hall". This is actually the second Skool with the original being in San Francisco. There are two couples that own the business: the Mirabells and the Naganos. As a disclaimer I should tell you that I met the wives first at the Sacramento Food Film Festival. Skool was kind enough to donate a dish to our Japanese night of showing The Birth of Sake. I hit it off with Olia right away and looked forward to trying their restaurant. So even though I had met the owners, I feel that this review stands apart from any influence because the food is good on its own. A few weeks later I went with a friend for dinner. She had also been eager to try Skool out based on the good word of mouth we'd been hearing. We ordered quite a bit. We started out with a selection of small plates. This is the smoked salmon chips. They are super crispy slices of salmon skin with just a thin layer of salmon still attached. 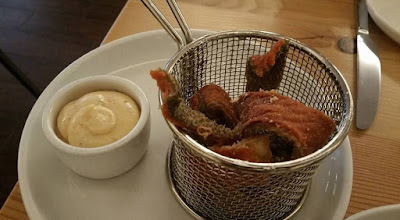 They are served with a miso aioli. Love them! I ordered them on my second visit as well. 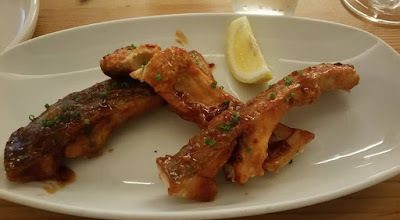 We also had the paku bbq ribs. Yes, there are fish big enough to supply ribs the size of pork babyback ribs! Being fish, they are super tender and the sticky bbq glaze was sweet and tangy and made with a Japanese whiskey. I know SNR mentioned they thought the sauce overpowered the fish, but I really liked them. We had also heard about the uni flan. 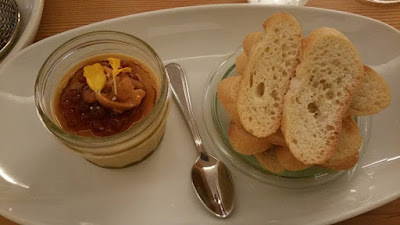 I like uni in moderation and I've also had Bill Ngo's uni panna cotta over at Kru, so I wasn't too interested, but my friend wanted to try it. It was smooth and has a light uni taste, a bit too light. But then again, uni is a hit/miss item and so many will love it this way. We had heard that the must have dish was the squid ink pasta, so we decided to split an order. Wonderful! 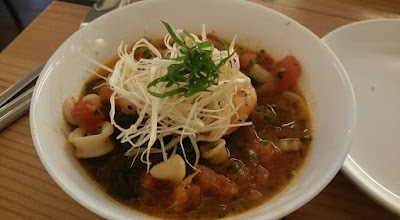 It has squid and shrimp, a garlic tomato compote, lemongrass dashi broth, and more. I loved the mixture of flavors. You'd pick up a note of this, then a bit of that. It was a party of flavors in my mouth. Next time I won't be sharing a bowl! We finished off sharing the two desserts. One was a meyer lemon panna cotta and the other was this lovely macha white chocolate cake in a jar. I'm not a fan of macha tea. It's too grassy for me. But this cake was light, subtle, and original! A must have if it's on the menu. This past weekend I went for brunch. Skool had been getting good press for dinner, but Olia wanted someone to write about brunch. This meant, of course, that I needed to order their unique brunch items and stay away from french toast. I ordered the squid ink grits, which would be the breakfast version of the pasta with a few changes. 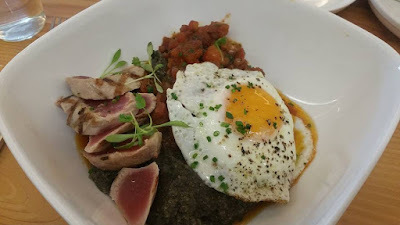 This time it was the grits cooked in a squid ink broth, topped with seared ahi, the garlic tomato compote, a sunnyside egg, and some other ingredients. It is very similar to the pasta, but just as delicious. Keep in mind that I am not a grits lover. I'm not into grits, polenta, cornbread, etc. Yet, I enjoyed this dish immensely and totally forgot that I was eating grits because all the flavors and textures kept me focused elsewhere. 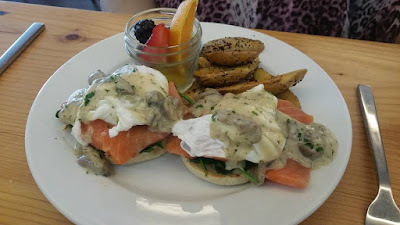 My friend ordered the smoked salmon benedict and was happy with the generous amount of salmon that sat atop some sauteed spinach and then was topped with a mushroom gravy. The fingerling potatoes were perfectly cooked and the fruit cup had a variety of items. A couple of other notes. They offer still, sparkling, tap water. If you don't want to be charged for bottled water, be sure to say you want the tap water. Service was excellent and the decor is nice. I particularly love the school themed tables and chairs with "Skool" branded into them. As to their location...if I had met them before they selected a location I might have veered them away just because that spot is not on the main dining drag and has had a few failed businesses before them. I truly hope that doesn't hurt them as well. I'm praying that the uniqueness of their menu and the quality of food and service will bring success. So far, so good as many are giving Skool positive reviews already.